If you have been injured in an accident in the Kitchener area, we would like to help you. We understand how an accident can change your life in many different ways. Being injured, out of work, in constant pain, and undergoing surgeries and physical therapy can take a massive toll on you and your family. When you or someone you love is injured, you will need to make some quick decisions which can be overwhelming and confusing. Receiving medical attention following an injury should always be your number one priority. Obtaining the advice of an experienced personal injury lawyer is your next important step. At Curran Law Firm, you can rely on our expertise and understanding of legal responsibilities and developments. We make every effort to simplify the process for you and to assist you each step of the way. Kitchener personal injury lawyer Peter Curran has a great deal of experience dealing with insurance companies. In the past, he has practiced as a trial lawyer working mainly for insurance companies defending claims by injured plaintiffs. This gives him invaluable insight into the methods used by those insurance companies to deny claims and avoid paying damages to injured claimants. If you’re injured and would like us to come to your home, contact Kitchener personal injury lawyer Peter Curran at 1-888-882-8121 or complete the short consultation form on this page. We are always available to do house and hospital calls. When we meet with you to discuss the details of your case we will give you an honest evaluation of your rights and legal options. 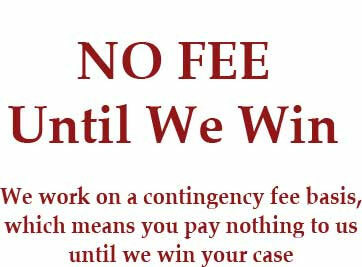 We work on a contingency fee basis, which means that you do not need to pay us any money, EVER, until we win your case.